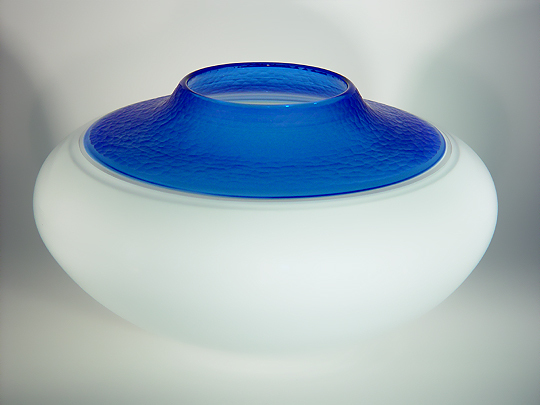 Conceptually, this work is more similar to B102 than any of my earlier Blomdahls... rather than Sonja's traditional vase form with wide base, narrow neck, and flared top, this work has no neck at all, with a wide base narrowing to a small opening. This work is also much smaller than any other Blomdahl I've ever seen... it's not even half the size of any of my other Blomdahls. As with B102, the top section has been coldworked using the battuto process, which results in the glass having a hammered or beaten appearance. The top of B103 is a single color, so there is no webwork of one color enclosing cells of another color as there is in B102. This work was directly inspired by a comment I made to Sonja when I visited her studio in October 2002, when I visited Seattle for the Pilchuck Auction. She had a small work in her studio, similar in shape to B102, but with a blue base and white top, and I told Sonja I loved that combination of colors. Three months later, Dan Kany e-mailed me images of this work. It didn't even take me five seconds to tell Dan I wanted to add it to my collection. 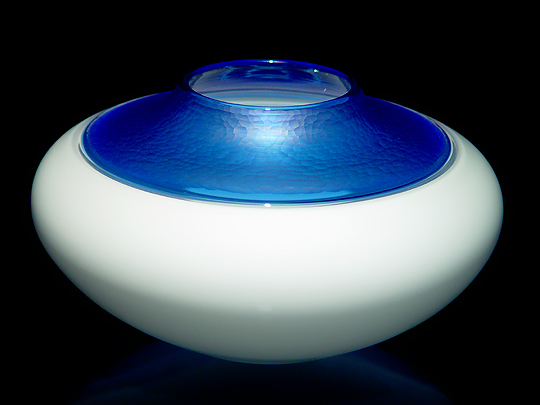 As with Sonja's other works, I think the form of B103 is great... also, I love the combination of colors (blue is probably my favorite color in glass, and white goes well with just about everything), and the battuto effect really adds another dimension to this work.